Blonde Ambition: Macro Happy Banana Omelette!! I like to train most mornings, simply because it sets my day up well. Sometimes I just do fasted cardio and then head back to the gym later in the day to do my weights, and sometimes I skip cardio and just weight train. Sometimes I’ll train 4 days in a week, some week’s I’ll train 6. Right now I am just doing what I feel like doing and what makes me happy. I’m slightly notorious for being late to the office too, unless I have trained. 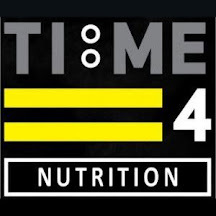 On days I train I wake up around 4/4.30am, I’m in the gym by 6.30am latest which is just around the corner from my office meaning on these mornings I skip all the morning traffic that can cause a 24 mile trip to take up to 90 minutes. On top of all of that, it makes me feel good and kick starts my day full of happy endorphins. Winner winner for Blonde. Once I finish training I freshen up, dress up and head to the office about 20 minutes before I’m due to start work and refuel my body with a relaxing breakfast and cup of tea. Here is the recipe for today’s super simple breakfast! 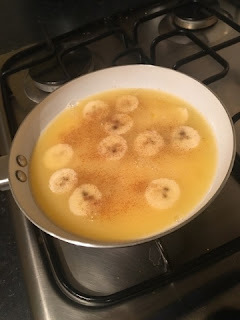 - Whisk together your egg whites & chop the banana, lay your banana on a non-stick pancake or omelette pan, pour the egg mixture over the top and sprinkle over the cinnamon. - Once the bottom of the omelette is cooked take your pan and put under the grill to cook the top. Double check the egg mixture is fully set by cutting into the omelette in the middle and both sides – sometimes the top is set but the middle can be a little runny in which case the omelette just needs an extra minute or so. Macro’s for the omelette: 27g Carbs, 5.3g Healthy Fats & 38.6g Protein. 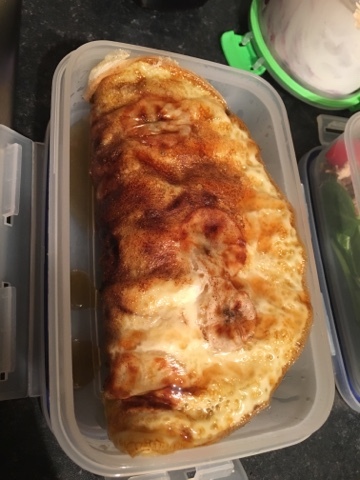 You can top with anything you like, to keep mine macro friendly I kept it simple and just used Musclefood fat free syrup. This can be made ahead and reheated for 2 minutes in the microwave.